Leading developers from across the length and breadth of Europe have been notified of their success in Europe’s most prestigious property competition International Property Awards in association with Google, New York times and Bloomberg Television. PSJ INVEST is delighted to announce that it becomes the one of the winners of main awards. The gala awards presentation and Property Awards Business Summit took place on the 22nd and 23rd September at the Park Lane Hotel in London’s Mayfair. PSJ INVEST presented the Main Point Karlin project nominated for the Best office development award. Finally Main Point Karlin receives highest five star award and PSJ INVEST becomes Czech Republic first development company to receive this highest award in course of 17 years long history. The event is part of the International Property Awards, which is now in its 17th year and has become recognised as the highest standard of excellence throughout the global industry. Attaining one of these coveted awards is evidence that PSJ INVEST is capable of excelling over some very strong contenders within the highly competitive European property arena. The judging panel consists of more than 80 professionals whose collective knowledge of the property industry is unsurpassed by any other property awards. This year’s judges include James Bacon, UK account manager of Google; Peter Bolton King, group chief executive (GCE) of the National Federation of Property Professionals; David Dalby of the Royal Institute of Chartered Surveyors (RICS); and Mike McNamara of the Royal Bank of Scotland (RBS). 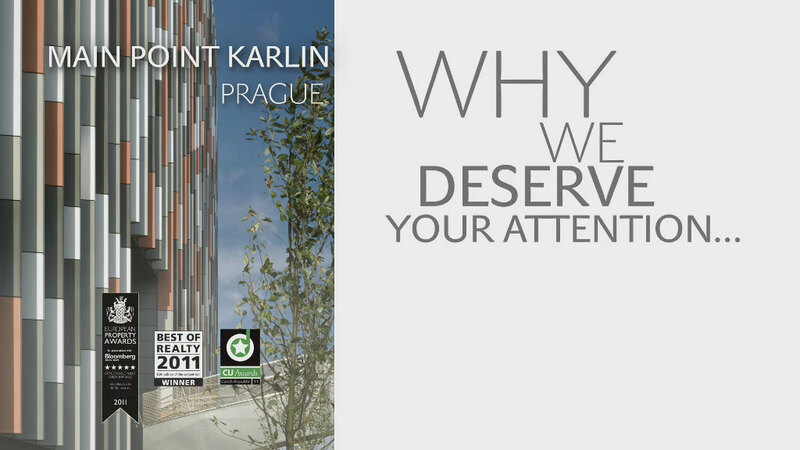 Main Point Karlin – a combination of unique architecture and the most sophisticated contemporary technology. An environmentally responsible building and first of all highly effective and comfortable interior areas – this is how the Main Point Karlin project may be described using only a few words. This ten-storied office building providing 22,000 square meters of lease area has the ambition to become the best rated building in the Central Europe according to the prestigious LEED certification system; we have been cooperation in this matter with our friends from Albanese Development Corp. in New York.